But I have heard him tell, with great animation, of the delight with which he looked on that vision of beauty. And I know that it remained a lovely spot on his memory to the latest years of his life. The flower had been lost sight of, and the privilege of having found it again made him glad. With the economy of a lover of nature, who never wastes, however great the wealth may seem to be, he gathered, in remembrance of that Clova idyl. The late Professor Balfour on one of his excursions came that way, and the finder sent a little to where the botanist was staying. It is said that certain playful youngsters of the student band caused the treasure to be placed under cover, and served up for dinner; and we can well believe that the old enthusiast forgot his hunger in his delight. This wild flower is only reported from the one site, but may have been overlooked on two or three of the heights of the same north-west corner of Forfar. Beyond this restricted area it has only as yet been found in the north of England, where it grows, at a much lower elevation, to a greater height. This would seem to show it is no denizen of the hills by birth and long tradition, but only one of the Shetland pony order of fairy plants, which, under more favourable conditions, would probably lose its alpine characteristics. I have seen it flowering freely enough in the gardens of Highland gamekeepers, who had brought a bit away as they were passing its haunts. The alpine catchfly, as it is named, presents a very miniature or fairy semblance of the extremely pretty crimson day-catchfly, abounding in most of our moist woods, and brightening so many of our stream banks; as if the larger flower had climbed up the hillside, and dwarfed as it rose higher. This crimson patch is the goal which, after visiting the rare corners of the glen, and seeing all that grows there, I intend reaching. The day is young, and, for so young a day, is used up. It has already parted with its morning freshness - if, in the early hours before I was abroad, it ever had any. There is sultriness in the breathless air, and a pitiless glare in the light. A lit haze fills the glen. Even Clova was open and breezy in comparison. If it is thus at eleven, what will it be at two? is a question I am in a position to answer from my recent experience. And there is less promise of shelter on these bare heights. Already it matters not on which side of a boulder one sits down. Moreover, the ascent has become sharper, and the road rougher. There is more of the climb in one's walk. The rush and noise and broken water of the stream alongside is a sufficient measure of the incline. Eleven is a good time for a rest. It is the hour chosen by outdoor workers, in the sunny months, for placing their backs against the shady side of the stooks. "Eleven hours" they call their forenoon break. The water is inviting, and here is a bank which will afford the skirt of a shadow. How brown my hands are! I must be like a mulatto! My last night's lodging had nothing so refined as a mirror, and the water is too broken to see! Stay, there is a quiet place behind the boulder! How still the glen is! 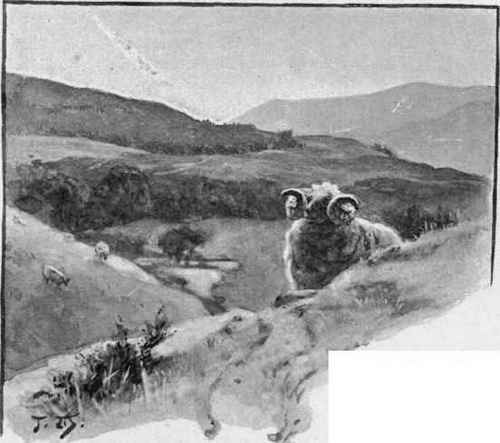 The "baa" of the black-faced sheep seems to emphasise the solitude! What is all the fuss about? No one is here to disturb-! A faint sound, resembling a footstep, reaches me, and, a few minutes afterwards, a man, accompanied by two dogs, appears on the bank overhead. The turn down to the water-side, though not a ruse, has served the same purpose. To all appearance, the man intended following, keeping, as far as possible, out of sight; but, missing me, he had ventured forward to reconnoitre: there he stands, revealed in all his brief authority. Now the positions are reversed. He has to go on, and I can watch him. It is rather an uncomfortable position for a spy. I dry my feet in the sun no very long process - why, they have a tint of brown on them already; leisurely put on my boots, and climb up the bank. My friend is equal to the occasion. In calculating on any advantage, I have reckoned without my host. Though he can scarce have got above two or three hundred yards away, and the glen is shelterless, save for some tumbled fragments of rock, he is nowhere in view. Instead of the sullen up-and-down movements of two tails, and the flash from a gun barrel, the sun All unreflected shone On bracken green, and cold grey stone. He has vanished into thin air, or dropped behind a boulder, or lain down all his length under some imperceptible rising of the ground - protectively coloured in his pepper-and-salt suit. And his dogs play up to him. Not a hair of them is to be seen. Once again he regains the advantage ; and so this mountain comedy passes through its several acts. An hour afterwards he suddenly reappears - from nowhere in particular. I look, and he is not; I look again, and, behold, he is within a few feet. I seize the chance of asking the nearest way to the hill on which the catchfly grows. This is adding insult to injury. He regards me more in sorrow than in anger, and solemnly warns me that, so far from helping, he will stand across my path. When he sees that the threat has not the desired effect, he melts into the Highland air, fades into the grass; and, though I never lose the uneasy sense that he is fixing me from behind every stone or tuft of mountain meadow grass, he returns no more. It is characteristic of these glens in the northwest corner of Forfar, that their wild flowers, with very few exceptions, are much alike. What you find in one, you may look for in the other. And as I shall visit a second, it is the less needful to tell all that grows here. Indeed, the similarity, if not so close, holds of that concentration of the Highlands, that eternal gathering of the clans, where the three counties of Forfar, Perth, and Aberdeen meet. It may be worth noticing, in the passing, that Perth and Forfar have an equal number of alpines, but not quite the same. Seven are absent from each county, which are present in the other. The purple mountain milk vetch, so common on seaside links, and again on the lower slopes of hills, passes, at a certain height on Craigmad, into the alpine form, which is mainly white, only tipped with purple. Elsewhere this alpine is found on Craigandree, at Braemar. A similar form, the yellow mountain oxytropis, grows among these hills, and not anywhere else, so far as I know, in Britain. The sun climbs slowly down as I climb slowly up. On the top I look round for that particular summit, whose shape I partly know. And then I go off in search of the patch of rose, whose charm is certainly not any greater than that of the spirit which once reflected it; which had brought to a halt and gladdened one who was at once a sportsman and a naturalist. Already are the shadows creeping up the eastern slopes. It will be as easy to reach the next glen as to trudge back to Clova. And the air of my lodging for the night is likely to be fresher.